I just tried all tips on this old topic: https://vanillaforums.org/discussion/14241/migration-from-localhost-to-webserver-bonk? 1. Edit 'conf/config.php' (database name, username, password). 1. Remove all *.ini files inside 'cache/' folder. 2. Double checked DB details in config.php. 3. CHMOD +755 to all files & folders in FTP. I noticed when make a fresh installation on local, DB tables looks like this; but fresh install on webserver, tables looks like this. ^- Anyway this is not my topic-related, because I'm exporting full SQL & Files from local -> webserver. I suggest you start a fresh install of the latest version of Vanilla on the web host and then migrate the files in your local database to the vanilla installation as an overwrite via ftp and not zip them. Run utility/structure to rebuild the tables as needed. The prefix on the new web server are the correct ones as far as I know. GDN and not gdn… make sure the sql is the the latest version of where you are migrating to. I "solved" this replacing gdn_ to GDN_ on the SQL file & uppercase on words, before uploading it to webserver. You did not post the errors that occurred … Probably from your own set up ? Problem is a mismatch on table names, between localhost and webserver. This ocurrs because on Windows database and table names are not case sensitive, and case sensitive in most varieties of Unix. Vanilla works nice on Windows (xampp, wampp,...), but when you export SQL and upload to webserver, all table names are in LOWERCASE. 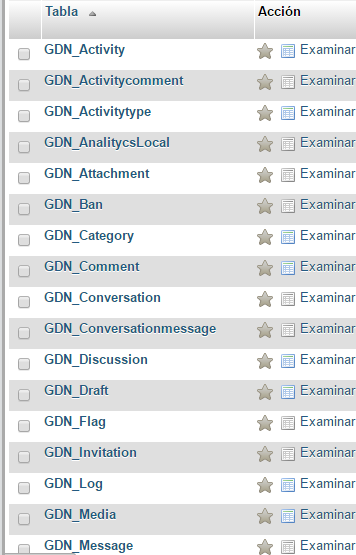 You must replace all "gdn_" to "GDN_" in .sql file, and like I said in my previous post. To fix this and enable CASE-SENSITIVE tables on Windows, you must follow this steps. 1. Edit "my.ini" (MySQL configuration file). 2. Search & Replace all "gdn_" -> "GDN_" ocurrences on exported .SQL file. You must replace the 38 table names too and would look like this: http://i.imgur.com/w7dyEMV.png (uppercase first letter of each table name). 3. Delete all Vanilla tables from database. Hope this solve the problem to all of you! Thanks for coming back with the solution for others who might encounter this issue !! figured I'd bump this since there was an issue reported and people may be testing and then upgrading to different systems for 2.3 upgrades.